The impact of many unfavorable childhood traits or diseases, such as low birth weight and mental disorders, is not limited to childhood and adolescence, as they are also associated with poor outcomes in adulthood, such as cardiovascular disease. Insight into the genetic etiology of childhood and adolescent traits and disorders may therefore provide new perspectives, not only on how to improve wellbeing during childhood, but also how to prevent later adverse outcomes. To achieve the sample sizes required for genetic research, the Early Growth Genetics (EGG) and EArly Genetics and Lifecourse Epidemiology (EAGLE) consortia were established. The majority of the participating cohorts are longitudinal population-based samples, but other cohorts with data on early childhood phenotypes are also involved. Cohorts often have a broad focus and collect(ed) data on various somatic and psychiatric traits as well as environmental factors. Genetic variants have been successfully identified for multiple traits, for example, birth weight, atopic dermatitis, childhood BMI, allergic sensitization, and pubertal growth. Furthermore, the results have shown that genetic factors also partly underlie the association with adult traits. As sample sizes are still increasing, it is expected that future analyses will identify additional variants. This, in combination with the development of innovative statistical methods, will provide detailed insight on the mechanisms underlying the transition from childhood to adult disorders. Both consortia welcome new collaborations. Policies and contact details are available from the corresponding authors of this manuscript and/or the consortium websites. The full author list for this manuscript, including affiliations, includes all current active members of both consortia and is listed at the end of the paper followed by the membership lists of the EGG and EAGLE consortia as well as the acknowledgments and disclosures of interests. In countries with a high-sociodemographic index, the major contributors to burden of disease during childhood and adolescence are non-communicable diseases such as obesity, asthma or allergies, and psychiatric disorders. These have a large cumulative impact on individuals, families and society . Moreover, many early-life traits track throughout childhood and adolescence into adulthood. Childhood obesity, for example, is associated with adult obesity and cardiovascular disease . Several childhood psychiatric disorders persist into adolescence and adulthood or precede severe mental illness such as schizophrenia, which usually starts at late adolescence or early adulthood [3, 4]. Low birth weight, as a proxy for a suboptimal intrauterine environment, has been shown to be robustly associated with many later-life non-communicable traits, including cardiovascular, respiratory and psychiatric disorders (see e.g., 5, 6, 7). This prompted researchers, including those within the Developmental Origins of Health and Disease (DOHaD) field, to investigate the basis for the early origins of later life differences in health and disease. Insight into the etiology of childhood and adolescent traits and disorders may provide new perspectives, not only on how to improve wellbeing during childhood, but also how to prevent later adverse outcomes. Individual differences in developmental phenotypes, such as body weight and composition, behavioral problems, language skills, and their stability across ages are partly influenced by genetic factors [8, 9, 10, 11, 12, 13]. Identifying the specific genetic variants that influence these traits, and the biological pathways through which they operate, can therefore help to unravel etiological mechanisms. Genetic studies can also define whether the relationships between childhood and adult traits, for example, birth weight and cardiovascular disease, are causally mediated by early life exposures. In addition, genetics can support how specific environmental factors contribute to variation in these traits, i.e., whether there is gene-environment interaction with the increase in risk depending on an individual’s genetic risk. It is increasingly recognized that large sample sizes are essential in genetic research  and studies performed in large international consortia have become the norm. 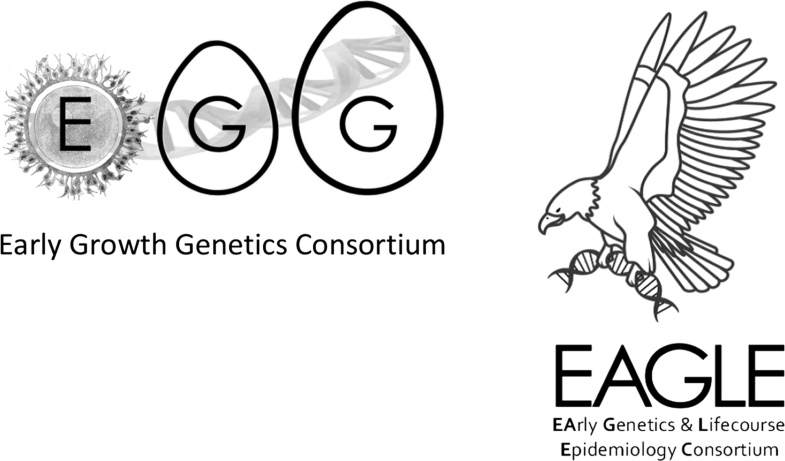 Two such consortia with a particular focus on the genetics of early life phenotypes are the Early Growth Genetics (EGG) consortium (http://egg-consortium.org/) and the EArly Genetics and Lifecourse Epidemiology (EAGLE) consortium (http://www.wikigenes.org/e/art/e/348.html) (Fig. 1). This paper describes these two consortia as they have shared objectives and the participating cohorts partly overlap. We also highlight the results so far and outline the directions of future research. to provide training opportunities for junior researchers to develop in the field of genetic epidemiology. The EGG and EAGLE consortia started as collaborations of population-based pregnancy and birth cohort studies, each of which has collected longitudinal data across a wide range of developmental phenotypes. As the collaboration developed, cohorts that started data collection during childhood and adolescence were also included. Almost all participating studies have genome-wide genotype data available. In addition, early life data collected through self-report and/or record linkage in adult biobanks, such as UK Biobank or the population based cohorts listed in Table 1 that have an adult counterpart, have been brought into the genome-wide association (GWA) meta-analyses for phenotypes such as birth weight. Both consortia welcome new collaborations, and they are keen to add data from longitudinal cohorts that are currently in the process of obtaining genotype data. Tables 1 and 2 provides a summary of the participating studies and their design, as of April 2018. Table 3 gives further details on the extensive data available, indicating, per cohort, whether data collection has taken place at least once at preschool, school, adolescent and adult age. However, many cohorts have had multiple follow-up rounds within any given period or follow-up data collection is ongoing, through research clinic assessments, questionnaires or record linkage. The majority of the cohorts have around equal numbers of males and females included. Observational cohort study, monitoring healthy young children from 9 to 36 months of age. Most cohorts were established with the aim of investigating risk and protective factors for a broad range of developmental phenotypes. They have collected data on physical traits, cognition, emotional and behavioral problems, as well as on lifestyle and environmental factors, such as smoking during pregnancy and physical exercise. Other cohorts were set up with a specific focus, such as asthma research, but many of these have collected ancillary information on a wider range of phenotypes. Table 2 gives an indication as to whether data collection was focused on a specific phenotype. Additional details on many of these studies will be available from cohort websites and publications (see Table 1). Participating cohorts have obtained DNA from blood samples, saliva or buccal swabs. A variety of different genotyping arrays have been used over the years, but meta-analysis has been facilitated by imputation of directly genotyped data using reference panels such as those generated by 1000 Genomes or the Haplotype Reference Consortium [15, 16]. Moreover, an increasing number of cohorts have, or plan to get, additional ‘omics data including parental genotypes, DNA methylation profiles, RNA expression levels, metabolomics and/or microbiome data. The implementation of GWA meta-analyses for each of the phenotypes of interest to EGG or EAGLE has usually been championed and organized at the level of a working group, formed by a subset of motivated investigators and analysts, who have assumed responsibility for assembling, combining and interpreting the genetic data. The wide range of phenotypes available to study across these consortia has provided fertile ground for many such working groups and has resulted in a large number of peer-reviewed papers across this wide range of phenotypes [17, 18, 19, 20, 21, 22, 23, 24, 25, 26, 27, 28, 29, 30, 31, 32, 33, 34, 35, 36, 37, 38, 39, 40, 41, 42, 43, 44, 45]. These are typically GWA meta-analyses, focusing on the effects of individual genetic variants, but increasingly now extend to multivariate, polygenic analyses, that evaluate the joint effects of multiple associated genetic variants and apply this information to address questions of causality. 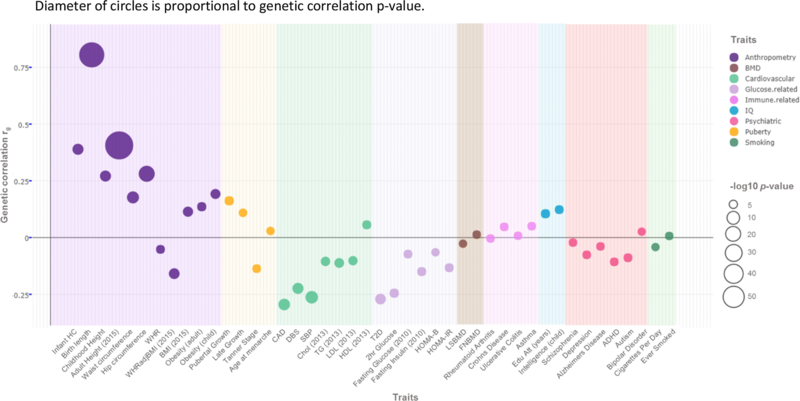 Amongst the many GWA analyses led by EGG and EAGLE, the traits for which the largest numbers of genetic loci reached genome-wide statistical significance (p < 10−8) have been birth weight (65 loci), atopic dermatitis (31), childhood BMI (15), allergic sensitization (10), and pubertal growth (10) [17, 19, 23, 26, 28, 36]. For other phenotypes with a large number of genome wide hits, such as age at menarche (108 loci) or ADHD (16 loci), the association analysis has involved collaborations with other consortia [25, 37]. The summary statistics for many of the genome-wide association studies undertaken by EGG and EAGLE investigators can be found on consortium websites (http://egg-consortium.org/; http://www.wikigenes.org/e/art/e/348.html) or are available from corresponding authors. As with adult phenotype GWA studies, the number of association signals recovered by these studies is influenced heavily by sample size (N = 182,416 for age at menarche, N = 153,781 for birth weight) and, to a lesser extent, by phenotype characteristics (somatic or behavioral traits, continuous or binary outcomes). In addition to cross-sectional GWA analyses, there have been many examples of projects that have investigated genetic relationships within childhood traits or between childhood traits and related adult phenotypes, often revealing shared genetic factors. For example, genetic overlap was found among related atopic conditions during childhood, and between atopic conditions and auto-immune disorders [19, 36]; among puberty-related phenotypes, and between puberty-related phenotypes and BMI [23, 24, 37]; between childhood and adult blood pressure ; between preschool internalizing symptoms and adult psychiatric disorders ; and between childhood and adult anthropometric traits [21, 26, 40, 44]. The development of statistical methods that support the calculation of genetic correlations from summary GWAS results  and the easy availability of such data from a growing number of GWA meta-analyses for adult traits have enabled these analyses to be undertaken with adequate statistical power. Figure 2 shows genetic correlations, calculated exclusively from GWAS data, between birth weight and a range of continuous and disease phenotypes , generated using the linkage disequilibrium score regression approach  as implemented in the LDHub web utility . For many cardiometabolic and anthropometric traits measured in late adult life, there is evidence of substantial sharing of genetic variation with birth weight. In line with the wider epidemiological data, the genetic correlations between birth weight and adult cardiometabolic traits (including type 2 diabetes, blood pressure, and coronary artery disease) tend to be negative. These data indicate that a substantial proportion of the observed covariance between birth weight and cardiometabolic disease predisposition is likely to be driven by genetic rather than environmental factors. However, the potential for more complex causal relationships (such as those that connect fetal genotype to adult disease via the correlation with maternal genotype and altered maternal environment) also needs to be considered. Full characterization of these complex relationships requires the application of statistical methods that enable partitioning of genetic effects into maternal and fetal components both at the level of individual SNPs  and genome-wide . Using the M-GCTA method , for example, it has been reported that maternal genotypes contribute more to gestational weight gain in the mother, while offspring genotypes contribute more to birth weight . Another critical advantage of genetic studies is the potential to characterize causal relationships using Mendelian randomization approaches . Tyrrell et al. found evidence of a positive causal effect of maternal BMI and fasting glucose levels on offspring birth weight but inverse effect of maternal systolic blood pressure on offspring birth weight. Despite bringing together the largest number of studies at the time with relevant data, there was insufficient power to dissect how the opposing effects of maternal glucose and systolic blood pressure are reflected in the maternal BMI effect (one reason why we are keen to extend the collaboration to any new cohorts). Crucially, however, appropriate application and interpretation of studies that seek to elucidate the mechanisms underlying associations between maternal and offspring phenotypes require investigators to consider diverse complicating factors including the correlation between maternal and fetal genetic instruments, and to account for these sources of potential bias in the Mendelian randomization analyses wherever possible . The longitudinal data collected in EGG and EAGLE cohorts provide the means to investigate whether the influence of genetic variants changes over time. This has only recently been explored given the need for large numbers of studies with repeated measures. We have found that genetic variation in FTO, one of the first BMI increasing genetic variants to be identified in GWAS and one of the variants most strongly associated with mean BMI (in adults) is inversely associated with BMI in infancy only becoming positive in later childhood and adult , indicating the value of research that explores gene-by-age interactions. On a genome-wide scale, using meta-regression methods, polygenic risk scores generated from adult schizophrenia data yielded associations with variation in childhood and adolescent psychiatric symptom scores, which strengthened in magnitude with increasing age . The aggregation of data in consortia such as EGG and EAGLE provides vastly improved sample sizes and a powerful way to overcome the major weakness of many of the early GWAS, which were, in hindsight, underpowered to detect the generally small genome-wide significant associations. 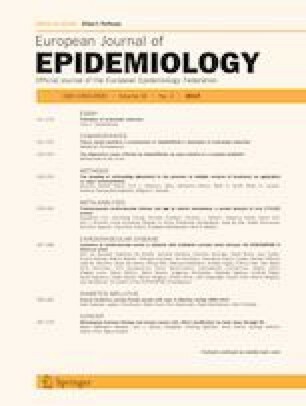 This has brought multiple robust association signals across many traits, and provided a valuable basis for dissecting the, often complex, causal relationships between epidemiologically-correlated traits. A clear strength of the EGG and EAGLE consortia is the wealth of data available. This encompasses not only repeated measures for physical and behavioral traits, but also copious information on lifestyle and environmental circumstances. Moreover, some of the cohorts have collected data for several decades, and now provide repeated measures well into adulthood. This enables developmental research as well as analyses of the interplay between genes and environment. To date, one of the limitations has been that the majority of participating cohorts have data based on European-ancestry populations (see Table 2 for exceptions). There is a clear need for equivalent data to be generated in samples from other ethnic groups, so that the genetic contribution to reproducible ethnic differences in the distribution of early life phenotypes can be explored and the implications for adult disease risk quantified. Since the cohorts are population-based and lack a particular disease-focus, the consortia are not so well-suited to investigate conditions with a low prevalence. They are better-placed to analyze common traits, particularly those that can be measured on continuous scales and analyzed as quantitative measures, such as blood pressure instead of hypertension and ADHD symptom score instead of ADHD diagnosis [32, 34]. Power analyses demonstrate that identification of a genetic variant is, in most circumstances, more powerful for continuous traits than for dichotomous variables based on clinical cut-offs . Considerable progress is to be expected from ongoing increases in sample sizes, especially for traits such as childhood aggression, ADHD-related traits and internalizing symptoms, where the number of identified genetic variants has been limited so far. Access to new data sets can motivate efforts to tackle phenotypes that have not hitherto been subject to detailed genetic analysis. The results emerging from many of these studies provide a timely reminder that analysis of early life phenotypes often requires researchers to consider the joint impacts of multiple genomes (e.g., those of the fetus and the mother) together with the web of environmental influences as potential contributors to individual variation. They also highlight the need to take into account the changes happening throughout development. This is now possible because of large, rich and complex datasets that support use of novel statistical methods for the analysis of causality or gene-by-age interaction [48, 49, 51, 54]. There have already been several examples of papers performing such analyses and this will only increase with the number of identified genetic variants. In addition, existing gender differences in the associations between early life and adult factors (such as cardiometabolic risk) suggest a need for more thorough analysis of the effects of gender on these early acting mechanisms. The focus to date on the role of maternal and offspring GWAS information indicates a failure to properly consider the contribution of genetic variation in the father that will be remedied as more data from complete trios and pedigrees becomes available. We are also planning to expand these consortia to accommodate access to the increasing amount of ‘omics data now becoming more available. Combining the results from EGG and EAGLE GWA analyses with those from DNA methylation analyses performed by the Pregnancy And Childhood Epigenetics (PACE) consortium  and with the pregnancy/child cohorts in the COnsortium of METabolomic Studies (COMETS; https://epi.grants.cancer.gov/comtets/) will shed further light on the biological mechanisms underlying associations of early-life risk factors and childhood, adolescent and adult health outcomes. The focus on translating this knowledge to clinical and public health settings represents a major motivation. Insight into genetic factors underlying stability in traits such as obesity and psychiatric disorders may aid in providing targeted interventions to the groups at highest need. A more complete understanding of the contributions of genetic and non-genetic factors in the relationships between early life and later life traits may focus attention on the most effective strategies for behavioural or environmental modification. We are grateful to all families and participants who took part in these studies. We also acknowledge and appreciate the unique efforts of the research teams and practitioners contributing to the collection of this wealth of data. C.M.M. is supported by funding from the European Union’s Horizon 2020 research and innovation programme under the Marie Sklodowska-Curie grant agreement no. 721567. J.F.F. has received funding from the European Union’s Horizon 2020 research and innovation programme under grant agreement No 633595 (DynaHEALTH) and 733206 (LifeCycle). R.M.F. and R.N.B. are supported by Sir Henry Dale Fellowship (Wellcome Trust and Royal Society grant: WT104150). D.L.C. is funded by the American Diabetes Association Grant 1-17-PDF-077. D.O.M-K. was supported by Dutch Science Organization (ZonMW-VENI Grant 916.14.023). N.M.W. is supported by an Australian National Health and Medical Research Council Early Career Fellowship (APP1104818). T.S.A. was partially funded by the Gene-Diet Interactions in Obesity (GENDINOB) project on behalf of GOYA male cohort data management and analyses and acknowledges the same. S.D. was supported by National Institute of Health Research. T.M.F. is supported by the European Research Council grant: 323195 SZ-245 50371-GLUCOSEGENES-FP7-IDEAS-ERC. The Novo Nordisk Foundation Center for Basic Metabolic Research is an independent Research Center at the University of Copenhagen partially funded by an unrestricted donation from the Novo Nordisk Foundation (www.metabol.ku.dk). H.H. is funded by The Children’s Hospital of Philadelphia Endowed Chair in Genomic Research. A.T.H. is supported by the Wellcome Trust Senior Investigator Awards (WT098395), National Institute for Health Research (NIHR) Senior Investigator Award (NF-SI-0611-10219). J.Hebebrand received grants from German Research Society, German Ministry of Education and Research. M-F.H. is currently supported by an American Diabetes Association (ADA) Pathway Program Accelerator Early Investigator Award (1-15-ACE-26). S.J. is supported by Helse Vest no. 23929, Bergen Forskningsstiftelse and KG Jebsen Foundation and University of Bergen. J.K. has been supported by the Academy of Finland Research Professor program (grants 265240 & 263278). J.P.K. is funded by a University of Queensland Development Fellowship (UQFEL1718945). H.L. has served as a speaker for Eli-Lilly and Shire and has received research grants from Shire; all outside the submitted work. C.M.L is supported by the Li Ka Shing Foundation, WT-SSI/John Fell funds and by the NIHR Biomedical Research Centre, Oxford, by Widenlife and NIH (5P50HD028138-27). S.E.M. was funded by an NHMRC Senior Reseach Fellowship (APP1103623). K.Panoutsopoulou is funded by a career development fellowship (grant 20308) and by the Wellcome Trust (WT098051). C.P. at UCL Institute of Child Health, with support from the National Institute for Health Research Biomedical Research Centre at Great Ormond Street Hospital for Children NHS Foundation Trust and University College London. I.P. was funded in part by the Wellcome Trust (WT205915), and the European Union’s Horizon 2020 research, the European Union FP7-IDEAS-ERC Advanced Grant (GEPIDIAB, ERC-AG – ERC- 294785), and innovation programme (DYNAhealth, H2020-PHC-2014-633595). R.C.R. is supported by CRUK (grant number C18281/A19169). J.G.S. is supported by an NHMRC Practitioner Fellowship Grant (APP1105807). J.T. is funded by the European Regional Development Fund (ERDF), the European Social Fund (ESF), Convergence Programme for Cornwall and the Isles of Scilly and the Diabetes Research and Wellness Foundation Non-Clinical Fellowship. N.V-T. is funded by a pre-doctoral grant from the Agència de Gestió d’Ajuts Universitaris i de Recerca (AGAUR) (2015 FI_B 00636), Generalitat de Catalunya. T.G.M.V was supported by ZonMW (TOP 40–00812–98–11010. J.F.W. is supported by the MRC Human Genetics Unit quinquennial programme “QTL in Health andDisease”. H.Y. is funded by Diabetes UK RD Lawrence fellowship (grant: 17/0005594). M.H.Z was supported by BBMRI-NL (CP2013-50). E.Z. is supported by the Wellcome Trust (098051). B.F. is supported by Novo Nordisk Foundation (12955) and an Oak Foundation Fellowship. S.S. and M-R.J. have received funding from the European Union’s Horizon 2020 research and innovation programme [under grant agreement No 633595] for the DynaHEALTH action. P.R.N. was supported by the European Research Council (ERC), University of Bergen, KG Jebsen and Helse Vest. G.D.S. works within the MRC Integrative Epidemiology Unit at the University of Bristol (MC_UU_12013/1). D.A.L was supported by the European Research Council under the European Union's Seventh Framework Programme (FP/2007-2013) / ERC Grant Agreement (Grant number 669545; DevelopObese), US National Institute of Health (grant: R01 DK10324), the UK Medical Research Council (grant: MC_UU_00011/6), Wellcome Trust GWAS grant (WT088806), an NIHR Senior Investigator Award (NF-SI-0611-10196) and the NIHR Biomedical Research Centre at University Hospitals Bristol NHS Foundation Trust and the University of Bristol. L.Paternoster was supported by the UK Medical Research Council Unit grants MC_UU_12013_5. N.J.T. is a Wellcome Trust Investigator (202802/Z/16/Z), is the PI of the Avon Longitudinal Study of Parents and Children (MRC & WT 102215/2/13/2), is supported by the University of Bristol NIHR Biomedical Research Centre (BRC) and works within the CRUK Integrative Cancer Epidemiology Programme (C18281/A19169). V.W.V.J. received an additional grant from the Netherlands Organization for Health Research and Development (NWO, ZonMw-VIDI 016.136.361), a European Research Council Consolidator Grant (ERC-2014-CoG-648916) and funding from the European Union’s Horizon 2020 research and innovation programme under grant agreement No 633595 (DynaHEALTH) and 733206 (LifeCycle). D.M.E. is funded by the UK Medical Research Council Unit grant MC_UU_12013_4, Australian Research Council Future Fellowship (FT130101709) and a NHMRC Senior Research Fellowship (GNT1137714). S.F.A.G. is funded by the Daniel B. Burke Endowed Chair for Diabetes Research and R01 HD056465. D.I.B. is supported by Spinozapremie (NWO-56-464-14192) and the Royal Netherlands Academy of Science Professor Award (PAH/6635) to DIB. M.I.M. is a Wellcome Senior Investgator and NIHR Senior Investigator supported by the Wellcome (090532, 098381, 203141), NIHR (NF-SI-0617-10090) and the NIHR Biomedical Research Centre, Oxford. The views expressed in this article are those of the author(s) and not necessarily those of the NHS, the NIHR, or the Department of Health. The ABCD study has been supported by grants from The Netherlands Organisation for Health Research and Development (ZonMW) and The Netherlands Heart Foundation. Genotyping was funded by the BBMRI-NL Grant CP2013-50. The UK Medical Research Council and Wellcome (Grant ref: 102215/2/13/2) and the University of Bristol provide core support for ALSPAC. A comprehensive list of grants funding is available on the ALSPAC website (http://www.bristol.ac.uk/alspac/external/documents/grant-acknowledgements.pdf). We acknowledge use of phenotype and genotype data from the British 1958 Birth Cohort DNA collection, funded by the Medical Research Council Grant G0000934 and the Wellcome Trust Grant 068545/Z/02. (http://www.b58cgene.sgul.ac.uk/). Genotyping for the B58C-WTCCC subset was funded by the Wellcome Trust Grant 076113/B/04/Z. The B58C-T1DGC genotyping utilized resources provided by the Type 1 Diabetes Genetics Consortium, a collaborative clinical study sponsored by the National Institute of Diabetes and Digestive and Kidney Diseases (NIDDK), National Institute of Allergy and Infectious Diseases (NIAID), National Human Genome Research Institute (NHGRI), National Institute of Child Health and Human Development (NICHD), and Juvenile Diabetes Research Foundation International (JDRF) and supported by U01 DK062418. B58C-T1DGC GWAS data were deposited by the Diabetes and Inflammation Laboratory, Cambridge Institute for Medical Research (CIMR), University of Cambridge, which is funded by Juvenile Diabetes Research Foundation International, the Wellcome Trust and the National Institute for Health Research Cambridge Biomedical Research Centre; the CIMR is in receipt of a Wellcome Trust Strategic Award (079895). The B58C-GABRIEL genotyping was supported by a contract from the European Commission Framework Programme 6 (018996) and grants from the French Ministry of Research. BAMSE was supported by The Swedish Heart-Lung Foundation, The Swedish Research Council, Stockholm County Council (ALF), the Strategic Research Programme (SFO) in Epidemiology at Karolinska Institutet, MeDALL (Mechanisms of the Development of ALLergy) a collaborative project conducted within the European Union (Grant agreement No. 261357), The Swedish Research Council Formas, the Swedish Environment Protection Agency and an ERC Grant from the EU (agreement n° 757919, TRIBAL to EM). We are graeful for the support of Dr. Karen Winer, Scientific Director of the Bone Mineral Density in Childhood Study. The research leading to these results has received funding from the European Research Council under the ERC Grant Agreement Number 268479—the BREATHE project. The Child and Adolescent Twin Study in Sweden study was supported by the Swedish Council forWorking Life, funds under the ALF agreement, the Söderström Königska Foundation and the Swedish Research Council (Medicine, Humanities and Social Science; Grant number 2017-02552, and SIMSAM). The research leading to these results has also received funding from the European Union Seventh Framework Programme (FP7/2007–2013) under Grant agreement No. 602768. The authors would also like to thank S. Kristinsson, L.A. Hermannsson and A. Krisbjörnsson of Raförninn ehf for extensive software design and contributions. CHOP was financially supported by an Institute Development Award from the Children’s Hospital of Philadelphia, a Research Development Award from the Cotswold Foundation, NIH Grant R01 HD056465 and the Daniel B. Burke Endowed Chair for Diabetes Research (SFAG). The CHS was supported by the Southern California Environmental Health Sciences Center (Grant P30ES007048); National Institute of Environmental Health Sciences (Grants 5P01ES011627, ES021801, ES023262, P01ES009581, P01ES011627, P01ES022845, R01 ES016535, R03ES014046, P50 CA180905, R01HL061768, R01HL076647, R01HL087680, RC2HL101651 and K99ES027870), the Environmental Protection Agency (Grants RD83544101, R826708, RD831861, and R831845), and the Hastings Foundation. All funding received by COPSAC is listed on www.copsac.com. The Lundbeck Foundation (Grant No. R16-A1694); The Ministry of Health (Grant No. 903516); Danish Council for Strategic Research (Grant No. 0603-00280B) and The Capital Region Research Foundation have provided core support to the COPSAC research center. DNBC-GOYA: This study is nested within the DNBC which was established with major grants from the Danish National Research Foundation, the Danish Pharmacists’ Fund, the Egmont Foundation, the March of Dimes Birth Defects Foundation, the Augustinus Foundation, and the Health Fund of the Danish Health Insurance Societies. The genotyping for DNBC-GOYA was funded by the Wellcome Trust (WT 084762). DNBC-PTB: This study is nested within the DNBC which was established and is maintained with major grants from the Danish National Research Foundation, the Danish Pharmacists’ Fund, the Egmont Foundation, the March of Dimes Birth Defects Foundation, the Augustinus Foundation, and the Health Fund of the Danish Health Insurance Societies. The generation of GWAS genotype data for the DNBC-PTB samples was carried out within the Gene Environment Association Studies (GENEVA) consortium with funding provided through the National Institutes of Health’s Genes, Environment, and Health Initiative (U01HG004423; U01HG004446; U01HG004438). The Exeter Family Study of Childhood Health (EFSOCH) was supported by South West NHS Research and Development, Exeter NHS Research and Development, the Darlington Trust and the Peninsula National Institute of Health Research (NIHR) Clinical Research Facility at the University of Exeter. The opinions given in this paper do not necessarily represent those of NIHR, the NHS or the Department of Health. Genotyping of the EFSOCH study samples was funded by the Welcome Trust and Royal Society Grant WT104150. We thank all participants who have contributed to Gen3G, many that are still be actively followed by our research team. Gen3G research team also acknowledges the Blood sampling in pregnancy clinic at the Centre Hospitalier Universitaire de Sherbrooke (CHUS); the assistance of clinical CHUS Research Centre research nurses and research assistants for recruiting women and obtaining consent for the study; the CHUS biomedical laboratory for performing assays; and the Research in obstetrics services for helping our placenta and cord blood collection. Gen3G has been supported by American Diabetes Association accelerator award #1-15-ACE-26, Fonds de recherche du Québec en santé #20697; Canadian Institute of Health Research #MOP 115071, and Diabète Québec grants. The generation and management of GWAS genotype data for the Generation R Study was done at the Genetic Laboratory of the Department of Internal Medicine, Erasmus MC, the Netherlands. We thank Pascal Arp, Mila Jhamai, Marijn Verkerk, Lizbeth Herrera and Marjolein Peters for their help in creating, managing and QC of the GWAS database. The general design of Generation R Study is made possible by financial support from the Erasmus Medical Center, Rotterdam, the Erasmus University Rotterdam, the Netherlands Organization for Health Research and Development (ZonMw), the Netherlands Organisation for Scientific Research (NWO), the Ministry of Health, Welfare and Sport and the Ministry of Youth and Families. This project has received funding from the European Union’s Horizon 2020 research and innovation programme under Grant agreements No. 633595 (DynaHEALTH) and 733206 (LIFECYCLE). The GINIplus study team wishes to acknowledge the following: Institute of Epidemiology, Helmholtz Zentrum München, German Research Center for Environmental Health, Neuherberg (Heinrich J, Brüske I, Schulz H, Flexeder C, Zeller C, Standl M, Schnappinger M, Ferland M, Thiering E, Tiesler C); Department of Pediatrics, Marien-Hospital, Wesel (Berdel D, von Berg A); Ludwig-Maximilians-University of Munich, Dr von Hauner Children’sHospital (Koletzko S); Child and Adolescent Medicine, University Hospital rechts der Isar of the Technical University Munich (Bauer CP, Hoffmann U); IUF- Environmental Health Research Institute, Düsseldorf (Schikowski T, Link E, Klümper C). GLAKU cohort has been supported by the Academy of Finland, Hope and Optimism Initiative, the Signe and Ane Gyllenberg Foundation, the Emil Aaltonen Foundation, the Foundation for Pediatric Research, the Foundation for Cardiovascular Research, the Juho Vainio Foundation, the Sigrid Jusélius Foundation, the Yrjö Jahnsson Foundation, and the University of Helsinki Research Funds. The Helsinki Birth Cohort Study (HBCS/HBCS 1934-44) thanks Professor David Barker and Tom Forsen. Major financial support was received from the Academy of Finland (project Grants 209072, 129255 Grant) and British Heart Foundation. The DNA extraction, sample quality control, biobank up-keep and aliquotting were performed at the National Institute for Health and Welfare, Helsinki, Finland. The Health2006 study was financially supported by grants from the Velux Foundation; the Danish Medical Research Council, Danish Agency for Science, Technology and Innovation; the Aase and Ejner Danielsens Foundation; ALK-Abello´ A/S (Hørsholm, Denmark), Timber Merchant Vilhelm Bangs Foundation, MEKOS Laboratories (Denmark) and Research Centre for Prevention and Health, the Capital Region of Denmark. This study was funded by grants from Instituto de Salud Carlos III (Red INMA G03/176; CB06/02/0041; PI041436; PI081151 incl. FEDER funds; PI12/01890 incl. FEDER funds; CP13/00054 incl. FEDER funds, FIS-FEDER: PI03/1615, PI04/1509, PI04/1112, PI04/1931, PI05/1079, PI05/1052, PI06/1213, PI07/0314, PI09/02647, PI11/01007, PI11/02591, PI11/02038, PI13/1944, PI13/2032, PI14/00891, PI14/01687, and PI16/1288; Miguel Servet-FEDER CP11/00178, CP15/00025, CPII16/00051, FIS-PI06/0867, FIS-PI09/00090, FIS-PI13/02187, 97/0588; 00/0021-2; PI061756; PS0901958; PI14/00677 incl. FEDER funds), CIBERESP, Generalitat de Catalunya-CIRIT 1999SGR 00241, Generalitat de Catalunya-AGAUR (2009 SGR 501, 2014 SGR 822), Fundació La marató de TV3 (090430), Spanish Ministry of Economy and Competitiveness (SAF2012-32991 incl. FEDER funds), Agence Nationale de Securite Sanitaire de l’Alimentation de l’Environnement et du Travail (1262C0010), EU Commission (261357, 308333, 603794, 634453, FP7-ENV-2011 cod 282957 and HEALTH.2010.2.4.5-1), Beca de la IV convocatoria de Ayudas a la Investigación en Enfermedades Neurodegenerativas de La Caixa, EC Contract No. QLK4-CT-2000-00263, Generalitat Valenciana: FISABIO (UGP 15-230, UGP-15-244, and UGP-15-249), Department of Health of the Basque Government (2005111093, 2009111069, 2013111089 and 2015111065), and the Provincial Government of Gipuzkoa (DFG06/002, DFG08/001 and DFG15/221) and annual agreements with the municipalities of the study area (Zumarraga, Urretxu , Legazpi, Azkoitia y Azpeitia y Beasain). ISGlobal is a member of the CERCA Programme, Generalitat de Catalunya. The Inter99 study was funded by the Danish Research Councils, Health Foundation, Danish Centre for Evaluation and Health Technology Assessment, Copenhagen County, Danish Heart Foundation, Ministry of Health and Prevention, Association of Danish Pharmacies, Augustinus Foundation, Novo Nordisk, Velux Foundation, Becket Foundation, and Ib Henriksens Foundation. The LISA study team wishes to acknowledge the following: Helmholtz Zentrum München, German Research Center for Environmental Health, Institute of Epidemiology, Munich (Heinrich J, Schnappinger M, Brüske I, Ferland M, Lohr W, Schulz H, Zeller C, Standl M); Department of Pediatrics, Municipal Hospital “St. Georg”, Leipzig (Borte M, Gnodtke E); Marien Hospital Wesel, Department of Pediatrics, Wesel (von Berg A, Berdel D, Stiers G, Maas B); Pediatric Practice, Bad Honnef (Schaaf B); Helmholtz Centre of Environmental Research – UFZ, Department of Environmental Immunology/Core Facility Studies, Leipzig (Herberth G, Lehmann I, Bauer M, Röder S, Schilde M, Nowak M, Herberth G , Müller J, Hain A); Technical University Munich, Department of Pediatrics, Munich (Hoffmann U, Paschke M, Marra S); Clinical Research Group Molecular Dermatology, Department of Dermatology and Allergy, Technische Universität München (TUM), Munich (Ollert M). This report includes independent research supported by National Institute for Health Research Respiratory Clinical Research Facility at Manchester University NHS Foundation Trust (Wythenshawe). The views expressed in this publication are those of the author(s) and not necessarily those of the NHS, the National Institute for Health Research or the Department of Health. MAAS was supported by the Asthma UK Grants No. 301 (1995–1998), No. 362 (1998–2001), No. 01/012 (2001–2004), No. 04/014 (2004–2007), the BMA James Trust and Medical Research Council, UK (G0601361) and The Moulton Charitable Foundation (2004-current); the Medical Research Council (MRC) Grants G0601361, MR/K002449/1 and MR/L012693/1, and Angela Simpson is supported by the NIHR Manchester Biomedical Research Centre. The authors would like to acknowledge the North West Lung Centre Charity for supporting this project. The Norwegian Mother and Child Cohort Study are supported by the Norwegian Ministry of Health and Care Services and the Ministry of Education and Research, NIH/NIEHS(contract noN01-ES-75558), NIH/NINDS (Grant No. 1 UO1 NS 047537-01 and Grant No. 2 UO1 NS 047537-06A1). The authors thank the National Health and Medical Research Council (NHMRC). Data collection in the NTR was supported by NWO: Twin-family database for behavior genetics and genomics studies (480-04-004); “Spinozapremie” (NWO/SPI 56-464-14192; “Genetic and Family influences on Adolescent psychopathology and Wellness” (NWO 463-06-001); “A twin-sib study of adolescent wellness” (NWO-VENI 451-04-034); ZonMW “Genetic influences on stability and change in psychopathology from childhood to young adulthood” (912-10-020); “Netherlands Twin Registry Repository” (480-15-001/674); “Biobanking and Biomolecular Resources Research Infrastructure” (BBMRI –NL (184.021.007). We acknowledge FP7-HEALTH-F4-2007, Grant agreement No. 201413 (ENGAGE), and the FP7/2007-2013 funded ACTION (Grant agreement No. 602768) and the European Research Council (ERC-230374). Part of the genotyping was funded by the Genetic Association Information Network (GAIN) of the Foundation for the National Institutes of Health, Rutgers University Cell and DNA Repository (NIMH U24 MH068457-06), the Avera Institute, Sioux Falls, South Dakota (USA) and the National Institutes of Health (NIH R01 HD042157-01A1, MH081802, Grand Opportunity Ggrants 1RC2 MH089951 and 1RC2 MH089995). The following are key grants for data collections and for laboratory work. NFBC1966 (31 years study) received financial support from University of Oulu Grant No. 65354, Oulu University Hospital Grant No. 2/97, 8/97, Ministry of Health and Social Affairs Grant No. 23/251/97, 160/97, 190/97, National Public Health Institute, Helsinki Grant No. 54121, Regional Institute of Occupational Health, Oulu, Finland Grant No. 50621, 54231, NHLBI Grant 5R01HL087679-02 through the STAMPEED program (1RL1MH083268-01), NIH/NIMH (5R01MH63706:02). NFBC1966 (46 years study) received financial support from University of Oulu Grant No. 24000692, Oulu University Hospital Grant No. 24301140, ERDF European Regional Development Fund Grant No. 539/2010 A31592. NFBCC1986 study has received financial support from EU QLG1-CT-2000-01643 (EUROBLCS) Grant No. E51560, NorFA Grant No. 731, 20056, 30167, USA / NIHH 2000 G DF682 Grant No. 50945, NIHM/MH063706, H2020-633595 DynaHEALTH action and Academy of Finland EGEA-project (285547). The PIAMA study was supported by The Netherlands Organization for Health Research and Development; The Netherlands Organization for Scientific Research; The Netherlands Lung Foundation (with methylation studies supported by AF 4.1.14.001); The Netherlands Ministry of Spatial Planning, Housing, and the Environment; and The Netherlands Ministry of Health, Welfare, and Sport. This study was supported by the National Institutes of Health (UG3OD23286, R01 HD034568, and R01 AI102960). These studies have been supported from multiple sources: National Health and Medical Research Council (901061, 950998, 241944, 1103603), Queensland Cancer Fund, Australian Research Council (A79600334, A79801419, A79906588, DP0212016) Human Frontiers Science Program (RG0154/1998-B) and Beyond Blue. The Raine Study acknowledges the National Health and Medical Research Council (NHMRC) for their long term contribution to funding the study over the last 25 years. Core Management of the Raine study has been funded by the University of Western Australia (UWA), Curtin University, the UWA Faculty of Medicine, Dentistry and Health Sciences, the Raine Medical Research Foundation, the Telethon Kids Institute, the Women’s and Infants Research Foundation, Edith Cowan University, Murdoch University, and the University of Notre Dame. This study was supported by the National Health and Medical Research Council of Australia [Grant Numbers 572613, 403981 and 003209] and the Canadian Institutes of Health Research [Grant Number MOP-82893]. The authors gratefully acknowledge the assistance of the Western Australian DNA Bank (National Health and Medical Research Council of Australia National Enabling Facility). This work was supported by resources provided by the Pawsey Supercomputing Centre with funding from the Australian Government and the Government of Western Australia. This project was carried out as part of the research program “Governing Obesity” funded by the University of Copenhagen Excellence Programme for Interdisciplinary Research (http://www.go.ku.dk). The SKOT studies were supported by grants from The Danish Directorate for Food, Fisheries and Agri Business as part of the ‘Complementary and young child feeding (CYCF)—impact on short- and long-term development and health’ project. This present study was supported with funds from the Region Zealand Health Sciences Research Foundation, the Innovation Fund Denmark (Grants 0603-00484B and 0603-00457B), and the Novo Nordisk Foundation (Grant Number NNF15OC0016544) and is part of the research activities in the Novo Nordisk Research Foundation Center for Basic Metabolic Research, University of Copenhagen (http://metabol.ku.dk/), and the Danish Childhood Obesity Biobank; Clinical Trials.gov ID-no: NCT00928473. TEDS is supported by a program grant to RP from the UK Medical Research Council (MR/M021475/1 and previously G0901245), with additional support from the US National Institutes of Health (AG046938). The research leading to these results has also received funding from the European Research Council under the European Union’s Seventh Framework Programme (FP7/2007-2013)/ Grant agreement No. 602768 and ERC Grant agreement No. 295366. RP is supported by a Medical Research Council Professorship award (G19/2). SS is supported by the MRC/IoPPN Excellence Award and by the US National Institutes of Health (AG046938). High performance computing facilities were funded with capital equipment grants from the GSTT Charity (TR130505) and Maudsley Charity (980). TRAILS (TRacking Adolescents’ Individual Lives Survey) is a collaborative project involving various departments of the University Medical Center and University of Groningen, the University of Utrecht, the Radboud Medical Center Nijmegen, and the Parnassia Bavo group, all in the Netherlands. TRAILS has been financially supported by grants from the Netherlands Organization for Scientific Research NWO (Medical Research Council program Grant GB-MW 940-38-011; ZonMW Brainpower Grant 100-001-004; ZonMw Risk Behavior and Dependence Grant 60-60600-97-118; ZonMw Culture and Health Grant 261-98-710; Social Sciences Council medium-sized investment Grants GB-MaGW 480-01-006 and GB-MaGW 480-07-001; Social Sciences Council project Grants GB-MaGW 452-04-314 and GB-MaGW 452-06-004; NWO large-sized investment Grant 175.010.2003.005; NWO Longitudinal Survey and Panel Funding 481-08-013); the Dutch Ministry of Justice (WODC), the European Science Foundation (EuroSTRESS project FP-006), Biobanking and Biomolecular Resources Research Infrastructure BBMRI-NL (CP 32), the participating universities, and Accare Center for Child and Adolescent Psychiatry. Statistical analyses are carried out on the Genetic Cluster Computer (http://www.geneticcluster.org), which is financially supported by the Netherlands Scientific Organization (NWO 480-05-003) along with a supplement from the Dutch Brain Foundation. The Young Finns Study has been financially supported by the Academy of Finland: Grants 286284, 134309 (Eye), 126925, 121584, 124282, 129378 (Salve), 117787 (Gendi), and 41071 (Skidi); the Social Insurance Institution of Finland; Competitive State Research Financing of the Expert Responsibility area of Kuopio, Tampere and Turku University Hospitals (Grant X51001); Juho Vainio Foundation; Paavo Nurmi Foundation; Finnish Foundation for Cardiovascular Research ; Finnish Cultural Foundation; The Sigrid Juselius Foundation; Tampere Tuberculosis Foundation; Emil Aaltonen Foundation; Yrjö Jahnsson Foundation; Signe and Ane Gyllenberg Foundation; Diabetes Research Foundation of Finnish Diabetes Association; and EU Horizon 2020 (Grant 755320 for TAXINOMISIS); and European Research Council (Grant 742927 for MULTIEPIGEN project). 1. Child Health Research Centre, University of Queensland, Brisbane, QLD, Australia. 2. Child and Youth Mental Health Service, Children’s Health Queensland Hospital and Health Service, Brisbane, QLD, Australia. 3. Department of Biological Psychology, Vrije Universiteit Amsterdam, Amsterdam, 1081 BT, The Netherlands. 4. The Generation R Study Group, Erasmus MC, University Medical Center Rotterdam, Rotterdam, 3015 CE, The Netherlands. 5. Department of Epidemiology, Erasmus MC, University Medical Center Rotterdam, Rotterdam, 3015 CE, The Netherlands. 6. Department of Pediatrics, Erasmus MC, University Medical Center Rotterdam, Rotterdam, 3015 CE, The Netherlands. 7. Wellcome Centre for Human Genetics, University of Oxford, Oxford, OX3 7BN, UK. 8. Oxford Centre for Diabetes, Endocrinology and Metabolism, University of Oxford, Oxford, OX3 7LE, UK. 9. RIKEN, Centre for Integrative Medical Sciences, Laboratory for Endocrinology, Metabolism and Kidney diseases, Yokohama, Kanagawa, 230-0045, Japan. 10. Institute of Biomedical and Clinical Science, University of Exeter Medical School, University of Exeter, Royal Devon and Exeter Hospital, Exeter, EX2 5DW, UK. 11. Center for Applied Genomics, The Children’s Hospital of Philadelphia, Philadelphia, PA 19104, USA. 12. Quantinuum Research LLC, San Diego, CA, 92101, USA. 13. ISGlobal, Institute for Global Health, Barcelona, 08003, Spain. 14. Universitat Pompeu Fabra (UPF), Barcelona, 08003, Spain. 15. CIBER de Epidemiología y Salud Pública (CIBERESP), Madrid, 28029, Spain. 16. Division of Human Genetics, The Children’s Hospital of Philadelphia, Philadelphia, PA 19104, USA. 17. Department of Genetics, Perelman School of Medicine, University of Pennsylvania, Philadelphia, 19104, USA. 18. MRC Epidemiology Unit, University of Cambridge School of Clinical Medicine, Cambridge, CB2 0QQ, UK. 19. Department of Epidemiology and Biostatistics, MRC-PHE Centre for Environment & Health, School of Public Health, Imperial College London, London, W2 1PG, UK. 20. Department of Clinical Epidemiology, Leiden University Medical Center, Leiden, 2333 ZA, The Netherlands. 21. Department of Public Health and Primary Care, Leiden University Medical Center, Leiden, 2333 ZA, The Netherlands. 22. Max Planck Institute for Psycholinguistics, Nijmegen, 6525 XD, The Netherlands. 23. Medical Research Council Integrative Epidemiology Unit at the University of Bristol, Bristol, BS8 2BN, UK. 24. University of Queensland Diamantina Institute, Translational Research Institute, Brisbane, QLD, 4072, Australia. 25. Department of Nutrition, University of North Carolina, Chapel Hill, NC 27599, USA. 26. Department of Clinical Sciences, Diabetes and Endocrinology, Lund University Diabetes Centre, Malmö, SE-205 02, Sweden. 27. COPSAC, Copenhagen Prospective Studies on Asthma in Childhood, Herlev and Gentofte Hospital, University of Copenhagen, Copenhagen, 2900 Hellerup, Denmark. 28. Novo Nordisk Foundation Center for Basic Metabolic Research, Section of Metabolic Genetics, Faculty of Health and Medical Sciences, University of Copenhagen, Copenhagen, DK-2200, Denmark. 29. Steno Diabetes Center Copenhagen, Gentofte, 2820, Denmark. 30. Division of Obstetrics and Gynaecology, The University of Western Australia, Crawley, WA, 6009, Australia. 31. Institute of Biomedicine, Physiology, University of Eastern Finland, Kuopio, 70211, Finland. 32. Center for Life Course Health Research, Faculty of Medicine, University of Oulu, Oulu, FI-90014, Finland. 33. Amsterdam Public Health, Amsterdam, The Netherlands. 34. Netherlands Twin Register, Department of Biological Psychology, VU University, Amsterdam, 1081 HV, The Netherlands. 35. University of Lausanne, Lausanne, CH-1015, Switzerland. 36. University of the Basque Country (UPV/EHU), Spain. 37. Biocruces Health Research Institute, Spain. 38. CIBER Diebetes y Enfermedades Metabólicas (CIBERDEM), Spain. 39. USC-Office of Population Studies Foundation, Inc., University of San Carlos, Cebu City, 6000, Philippines. 40. Department of Nutrition and Dietetics, University of San Carlos, Cebu City, 6000, Philippines. 41. Section of Epidemiology & Biostatistics, School of Population Health, University of Auckland, Auckland, New Zealand. 42. Population, Policy and Practice, UCL Great Ormond Street Institute of Child Health, University College London, London, WC1N 1EH, UK. 43. Department of Tropical Hygiene, Faculty of Tropical Medicine, Mahidol University, Bangkok, 10400, Thailand. 44. Department of Preventive Medicine, Keck School of Medicine, University of Southern California, Los Angeles, California, USA. 45. Institute for Molecular Bioscience, University of Queensland, QLD, Australia. 46. Medical Research Council Lifecourse Epidemiology Unit, University of Southampton, Southampton, SO17 1BJ, UK. 47. Division of Infection Immunity and Respiratory Medicine, School of Biological Sciences, The University of Manchester, Manchester Academic Health Science Centre, and Manchester University NHS Foundation Trust, Manchester, M13 9NT, UK. 48. Department of Paediatrics, Imperial College London, London, SW7 2AZ, UK. 49. Avera Institute for Human Genetics, Sioux Falls, South Dakota, USA. 50. Department of Nutrition and Dietetics, School of Health Science and Education, Harokopio University, Athens, 17671, Greece. 51. Department of Pediatrics, Division of Respiratory Medicine, Erasmus MC, University Medical Center Rotterdam, Rotterdam, The Netherlands. 52. Department of Pediatrics, Division of Neonatology, Erasmus MC, University Medical Center Rotterdam, Rotterdam, The Netherlands. 53. School of Human Sciences, The University of Western Australia, WA, Australia. 54. West Australian Sleep Disorders Research Institute, Department of Pulmonary Physiology & Sleep Medicine, Sir Charles Gairdner Hospital, WA, Australia. 55. Copenhagen Prospective Studies on Asthma in Childhood, Herlev and Gentofte Hospital, University of Copenhagen, Denmark. 56. Department of Bio and Health Informatics, Technical University of Denmark, Denmark. 57. National Institute for Health and Welfare, Helsinki, 00271, Finland. 58. Department of General Practice and Primary Health Care, University of Helsinki and Helsinki University Hospital, Helsinki, 00014, Finland. 59. Folkhälsan Research Center, Helsinki, 00250, Finland. 60. Sidra Medicine Research Center, Sidra Medicine, Doha, Qatar. 61. Department of Epidemiology Research, Statens Serum Institute, Copenhagen, DK-2300, Denmark. 62. Department of Radiology, Children’s Hospital Los Angeles, Los Angeles, CA 90027, USA. 63. Population Health Sciences, Bristol Medical School, University of Bristol, Bristol, BS8 2BN, UK. 64. Institute for Molecular Medicine Finland FIMM, University of Helsinki, Helsinki, Finland. 65. Department of Pediatrics, University of California San Francisco School of Medicine, San Francisco, CA 94143, USA. 66. Department of Pediatrics, Perelman School of Medicine, University of Pennsylvania, Philadelphia, PA 19104, USA. 67. Department of Psychiatry, University of Groningen, University Medical Center Groningen, Groningen, The Netherlands. 68. NIHR Exeter Clinical Research Facility, University of Exeter Medical School and Royal Devon and Exeter NHS Foundation Trust, Exeter, EX2 5DW, UK. 69. Department of Medicine, Division of Endocrinology, Metabolism, and Molecular Medicine, Feinberg School of Medicine, Northwestern University, Chicago, IL 60611, USA. 70. Department of Child and Adolescent Psychiatry, Psychosomatics and Psychotherapy, University Hospital Essen, University of Duisburg-Essen, Essen, 45141, Germany. 71. Institute of Epidemiology, Helmholtz Zentrum München - German Research Center for Environmental Health, Neuherberg, Germany. 72. Institute and Outpatient Clinic for Occupational, Social and Environmental Medicine, University Hospital of Ludwig Maximilians University, Munich, Germany. 73. KG Jebsen Center for Diabetes Research, Department of Clinical Science, University of Bergen, Bergen, N-5020, Norway. 74. Department of Pediatrics, Haukeland University Hospital, Bergen, 5021, Norway. 75. Department of Genetics and Bioinformatics, Domain of Health Data and Digitalisation, Norwegian Institute of Public Health, Oslo, N-0473, Norway. 76. Department of Paediatrics and Adolescent Medicine, Aarhus University Hospital, Aarhus N, DK-8200, Denmark. 77. Programs in Metabolism and Medical & Population Genetics, Broad Institute of Harvard and MIT, Cambridge, MA 02142, USA. 78. Department of Genetics, Harvard Medical School, Boston, MA 02115, USA. 79. Division of Endocrinology and Center for Basic and Translational Obesity Research, Boston Children’s Hospital, Boston, MA, 02115, USA. 80. Department of Population Medicine, Harvard Pilgrim Health Care Institute, Harvard Medical School, Boston, MA 02215, USA. 81. Diabetes Center, Massachusetts General Hospital, Boston, MA 02114, USA. 82. Department of Medicine, Universite de Sherbrooke, Sherbooke, QC J1K 2R1, Canada. 83. Institute of Nutritional Science, University of Potsdam, Nuthetal, 14558, Germany. 84. The First Affiliated Hospital of Jinan University, Guangzhou, 510630, China. 85. Human Development & Health, Faculty of Medicine, University of Southampton, Southampton, SO17 1BJ, UK. 86. Telethon Kids Institute (TKI), The University of Western Australia, WA, Australia. 87. Australian Centre for Precision Health, University of South Australia Cancer Research Institute, Adelaide, SA, 5001, Australia. 88. South Australian Health and Medical Research Institute, Adelaide, SA, 5001, Australia. 89. Department of Statistics and Computational Research, Universitat de València, Spain. 90. Epidemiology and Environmental Health Joint Research Unit, FISABIO-Universitat Jaume I-Universitat de València, Spain. 91. Department of Medical Genetics, Haukeland University Hospital, Bergen, Norway. 92. Department of Genetics and Bioinformatics, Norwegian Institute of Public Health, Oslo, N-0403, Norway. 93. Centre for Fertility and Health, Norwegian Institute of Public Health, Oslo, N-0403, Norway. 94. Department of Global Public Health and Primary Care, University of Bergen, Norway. 95. Department of Clinical Physiology, Tampere University Hospital, Tampere, Finland. 96. Department of Clinical Physiology, Finnish Cardiovascular Research Center - Tampere, Faculty of Medicine and Life Sciences, University of Tampere, Tampere, Finland. 97. Division of Gastroenterology, Hepatology and Nutrition, Cincinnati Children’s Hospital Medical Center, Cincinnati, OH 45229, USA. 98. Department of Public Health, University of Helsinki, Helsinki, Finland. 99. Department of Epidemiology and Biostatistics, School of Public Health, Imperial College London, London, UK. 100. Observational & Pragmatic Research Institute Pte Ltd, Singapore, Singapore. 101. University of Groningen, University Medical Center Groningen, Department of Pediatric Pulmonology and Pediatric Allergology, Beatrix Children’s Hospital, GRIAC Research Institute Groningen, Groningen, The Netherlands. 102. Pediatric Research Center, Department of Women´s & Child Health, University of Leipzig, Leipzig, 04109, Germany. 103. IFB Adiposity Diseases, University of Leipzig, Leipzig, 04109, Germany. 104. Department of Child Health, School of Medicine, Cardiff Univeristy, Cardiff, CF10 3AT, UK. 105. Danish Pediatric Asthma Center, Copenhagen University Hospital, Gentofte, DK-2100, Denmark. 106. Institute of Environmental Medicine, Karolinska Institutet, Sweden. 107. Department of Public Health Epidemiology, Unit of Chronic Disease Epidemiology, Swiss Tropical and Public Health Institute, Basel, University of Basel, Switzerland. 108. Institute of Social and Preventive Medicine, Lausanne University Hospital (CHUV), Lausanne, 1011, Switzerland. 109. Swiss Institute of Bioinformatics, Lausanne, 1015, Switzerland. 110. Helsinki Collegium for Advanced Studies, University of Helsinki, Helsinki, Finland. 111. Department of Psychology and Logopedics, Faculty of Medicine, University of Helsinki, Helsinki, Finland. 112. Division of Endocrinology, Department of Medicine, Creighton University, Omaha, NE 68178, USA. 113. School of Medicine Sciences, Örebro University, Sweden. 114. Department of Medical Epidemiology and Biostatistics, Karolinska Institutet, Sweden. 115. Department of Clinical Chemistry, Fimlab Laboratories, Tampere University Hospital, Tampere, Finland. 116. Department of Clinical Chemistry, Finnish Cardiovascular Research Center - Tampere, Faculty of Medicine and Life Sciences, University of Tampere, Tampere, 33520, Finland. 117. Li Ka Shing Centre for Health Information and Discovery, The Big Data Institute, University of Oxford, Oxford, OX3 7LF, UK. 118. The Broad Institute of Harvard and MIT, Cambridge, USA. 119. Center for Clinical Research and Prevention, Bispebjerg and Frederiksberg Hospital, The Capital Region, Frederiksberg, 2000, Denmark. 120. Department of Clinical Medicine, Faculty of Health and Medical Sciences, University of Copenhagen, Copenhagen, Denmark. 121. Centre for Ethics, Law and Mental Health, University of Gothenburg, Sweden. 122. Gillberg Neuropsychiatry Centre, University of Gothenburg, Sweden. 123. Department of Medicine and Therapeutics, The Chinese University of Hong Kong, Hong Kong, China. 124. Li Ka Shing Institute of Health Sciences, The Chinese University of Hong Kong, Hong Kong, China. 125. Hong Kong Institute of Diabetes and Obesity, The Chinese University of Hong Kong, Hong Kong, China. 126. Estonian Genome Center, University of Tartu, Tartu, 50090, Estonia. 127. Institute for Social Science Research, University of Queensland, QLD, Australia. 128. QIMR Berghofer Medical Research Institute, QLD, Australia. 129. Amsterdam Reproduction and Development, Amsterdam, The Netherlands. 130. Centre for Genetic Origins of Health and Disease (GOHaD), The University of Western Australia, Crawley, WA, 6000, Australia. 131. Department of Medicine, Stanford School of Medicine, Stanford, CA 94305, USA. 132. Sachs’ Children’s Hospital, Sweden. 133. Department of Genetics, University of North Carolina, Chapel Hill, NC 27599, USA. 134. Department of Public Health, Section of Epidemiology, Faculty of Health and Medical Sciences, University of Copenhagen, Copenhagen, Copenhagen, DK-1014, Denmark. 135. Department of Biostatistics, University of Liverpool, Liverpool, L69 3GL, UK. 136. Department of Pediatrics, University of Iowa, Iowa City, IA 52242, USA. 137. School of Public Health, The University of Queensland, QLD, Australia. 138. Research Unit for Gynaecology and Obstetrics, Institute of Clinical Research, University of Southern Denmark, Odense, DK-5000, Denmark. 139. Department of Epidemiology, University of Groningen, University Medical Center Groningen, Groningen, The Netherlands. 140. William Harvey Research Institute, Barts and the London School of Medicine and Dentistry, Queen Mary University of London, London, EC1M 6BQ, UK. 141. Medical Research Council (MRC), Social, Genetic and Developmental Psychiatry Centre, Institute of Psychiatry, Psychology & Neuroscience, King’s College London, London, SE5 8AF, UK. 142. Division of Pediatric Endocrinology, Diabetes, and Metabolism, Department of Pediatrics, Columbia University Medical Center, New York, NY 10032, USA. 143. Obesity Prevention Program, Department of Population Medicine, Harvard Medical School and Harvard Pilgrim Health Care Institute, Boston, MA 02215, USA. 144. Research Centre of Applied and Preventive Cardiovascular Medicine, University of Turku, Turku, 20014, Finland. 145. Paavo Nurmi Centre, Sports and Exercise Medicine Unit, Department of Physical Activity and Health, University of Turku, Turku, Finland. 146. Wellcome Sanger Institute, Hinxton, Cambridgeshire, CB10 1HH, UK. 147. School of Medicine and Public Health, Faculty of Medicine and Health, The University of Newcastle, Callaghan, NSW, 2308, Australia. 148. Centre for Occupational and Environmental Medicine, Stockholm County Council, Sweden. 149. MRC Social, Genetic and Developmental Psychiatry Centre, King’s College London, London, UK. 150. Section of Genomics of Common Disease, Department of Medicine, Imperial College London, London, SW7 2AZ, UK. 151. Department of Psychology, University of Jyväskylä, Jyväskylä, Finland. 152. Department of Clinical Physiology and Nuclear Medicine, Turku University Hospital, Turku, 20520, Finland. 153. BHF Centre for Cardiovascular Science, University of Edinburgh, Queen’s Medical Research Institute, Edinburgh, EH16 4TJ, UK. 154. Department of Internal Medicine, Erasmus MC, University Medical Center Rotterdam, Rotterdam, 3015 CE, The Netherlands. 155. Department of Psychology, Mid Sweden University, Östersund, SE-831 25, Sweden. 156. Department of Psychological and Brain Sciences, Indiana University, Bloomington, Indiana, USA. 157. Department of Medicine, Division of Endocrinology, Boston Children’s Hospital, Boston, MA 02115, USA. 158. Program in Medical and Population Genetics, Broad Institute of Harvard and MIT, Cambridge, MA 02142, USA. 159. Center for Basic and Translational Obesity Research, Boston Children’s Hospital, Boston, MA 02115, USA. 160. Subdirección de Salud Pública y Adicciones de Gipuzkoa, San Sebastián, Spain. 161. Instituto de Investigación Sanitaria Biodonostia, San Sebastián, Spain. 162. Saw Swee Hock School of Public Health, National University of Singapore, National University Health System, Singapore, 119077, Singapore. 163. Singapore Eye Research Institute, Singapore, 168751, Singapore. 164. Metro North Mental Health Service, QLD, Australia. 165. Queensland Centre for Mental Health Research, QLD, Australia. 166. Department of Epidemiology, Cancer Center, University of Hawaii (Manoa), Honolulu, Hawaii, 96813, USA. 167. Department of Obstetrics and Gynecology, Erasmus MC, University Medical Center Rotterdam, Rotterdam, 3015 CE, The Netherlands. 168. Population Health Research Institute, St George’s University of London, London, SW17 0RE, UK. 169. School of Physiotherapy and Exercise Science, Faculty of Health Sciences, Curtin University, Perth, WA, Australia. 170. Helsinki University Central Hospital, University of Helsinki, Helsinki, Finland. 171. Clinicum, University of Helsinki, Helsinki, Finland. 172. Department of Statistics and Applied Probability, National University of Singapore, Singapore, 117546, Singapore. 173. Life Sciences Institute, National University of Singapore, Singapore, 117456, Singapore. 174. Division of Metabolic and Nutritional Medicine, Dr. von Hauner Children’s Hospital, University of Munich Medical Center, Munich, 80337, Germany. 175. ib-salut, Area de Salut de Menorca, Spain. 176. Fundació Institut d’Investigació Sanitària Illes Balears – IdISBa, Spain. 177. European Centre for Environment and Human Health, University of Exeter, Truro, TR1 3HD, UK. 178. Department of Medicine, University of Turku, Turku, Finland. 179. Division of Medicine, Turku University Hospital, Turku, Finland. 180. Center for Genomic Regulation (CRG), Barcelona Institute of Science and Technology, Spain. 181. Barcelonabeta Brain Research Center (BBRC), Pasqual Maragall Foundation, Barcelona, Spain. 182. Groningen Research Institute for Asthma and COPD (GRIAC), University of Groningen, University Medical Center Groningen, Groningen, 9700 RB, The Netherlands. 183. Department of Public Health, Amsterdam Public Health Research Institute, Academic Medical Center (AMC), University of Amsterdam, Amsterdam, 1105 AZ, The Netherlands. 184. Institute of Medical Statistics and Epidemiology, Technical University Munich, Munich, D-80333, Germany. 185. Institute of Medical Informatics, Biometry and Epidemiology, Ludwig Maximilians University, Munich, 81377, Germany. 186. Usher Institute for Population Health Sciences and Informatics, University of Edinburgh, Edinburgh, EH8 9AG, UK. 187. MRC Human Genetics Unit, Institute of Genetics and Molecular Medicine, University of Edinburgh, Edinburgh, EH4 2XU, UK. 188. Queensland Brain Institute, University of Queensland, QLD, Australia. 189. Genetics of Complex Traits, University of Exeter Medical School, Royal Devon & Exeter Hospital, Exeter, EX2 5DW, UK. 190. Department of Clinical Epidemiology and Biostatistics, Amsterdam Public Health Research Institute, Academic Medical Center, University of Amsterdam, Amsterdam, The Netherlands, 1105 AZ, The Netherlands. 191. Division of Gastroenterology, Hepatology and Nutrition, The Children’s Hospital of Philadelphia, Philadelphia, PA 19104, USA. 192. Department of Clinical Physiology and Nuclear Medicine, Kuopio University Hospital, Kuopio, 70210, Finland. 193. Kuopio Research Institute of Exercise Medicine, Kuopio, 70100, Finland. 194. IMIM (Hospital del Mar Medical Research Institute), Barcelona, 08003, Spain. 195. Biocenter Oulu, University of Oulu, Oulu, 90220, Finland. 196. Department of Genomics of Complexe Diseases, Imperial College, London, UK. 197. Department of Obstetrics and Gynecology, Sahlgrenska Academy, University of Gothenburg, Diagnosvägen 15, SE-416 85 Gothenburg, Sweden. 198. Norwegian Institute of Public Health, Norway. 199. Bristol NIHR Biomedical Research Centre, Bristol, UK. 200. Department of Paediatrics, University of Cambridge, Cambridge, CB2 0QQ, UK. 201. Child and Adolescent Psychiatry, Erasmus Medical Center, Rotterdam, The Netherlands. 202. Social and Behavioral Sciences, Harvard TH Chan School of Public Health, Harvard University, Boston, USA. 203. Unit of Primary Care, Oulu University Hospital, Oulu, 90220, Finland. 204. Department of Life Sciences, College of Health and Life Sciences, Brunel University London, Middlesex, UB8 3PH, UK. 205. Oxford National Institute for Health Research (NIHR) Biomedical Research Centre, Churchill Hospital, Oxford, OX3 7LE, UK. Members as of July 2018 are listed in alphabetical order. 1. Department of Nutrition, University of North Carolina, Chapel Hill, NC 27599, USA. 2. Department of Clinical Sciences, Diabetes and Endocrinology, Lund University Diabetes Centre, Malmö, SE-205 02, Sweden. 3. COPSAC, Copenhagen Prospective Studies on Asthma in Childhood, Herlev and Gentofte Hospital, University of Copenhagen, Copenhagen, 2900 Hellerup, Denmark. 4. Novo Nordisk Foundation Center for Basic Metabolic Research, Section of Metabolic Genetics, Faculty of Health and Medical Sciences, University of Copenhagen, Copenhagen, DK-2200, Denmark. 5. Steno Diabetes Center Copenhagen, Gentofte, 2820, Denmark. 6. Division of Obstetrics and Gynaecology, The University of Western Australia, Crawley, WA, 6009, Australia. 7. Institute of Biomedicine, Physiology, University of Eastern Finland, Kuopio, 70211, Finland. 8. Institute of Biomedical and Clinical Science, University of Exeter Medical School, University of Exeter, Royal Devon and Exeter Hospital, Exeter, EX2 5DW, UK. 9. University of Lausanne, Lausanne, CH-1015, Switzerland. 10. Department of Epidemiology and Biostatistics, MRC-PHE Centre for Environment & Health, School of Public Health, Imperial College London, London, W2 1PG, UK. 11. Department of Biological Psychology, Vrije Universiteit Amsterdam, Amsterdam, 1081 BT, The Netherlands. 12. Amsterdam Public Health, Amsterdam, The Netherlands. 13. Amsterdam Reproduction and Development, Amsterdam, The Netherlands. 14. Netherlands Twin Register, Department of Biological Psychology, VU University, Amsterdam, 1081 HV, The Netherlands. 15. USC-Office of Population Studies Foundation, Inc., University of San Carlos, Cebu City, 6000, Philippines. 16. Department of Nutrition and Dietetics, University of San Carlos, Cebu City, 6000, Philippines. 17. Center for Applied Genomics, The Children’s Hospital of Philadelphia, Philadelphia, PA 19104, USA. 18. Quantinuum Research LLC, San Diego, CA, 92101, USA. 19. ISGlobal, Institute for Global Health, Barcelona, 08003, Spain. 20. Universitat Pompeu Fabra (UPF), Barcelona, 08003, Spain. 21. CIBER de Epidemiología y Salud Pública (CIBERESP), Madrid, 28029, Spain. 22. Section of Epidemiology & Biostatistics, School of Population Health, University of Auckland, Auckland, New Zealand. 23. Population, Policy and Practice, UCL Great Ormond Street Institute of Child Health, University College London, London, WC1N 1EH, UK. 24. Department of Tropical Hygiene, Faculty of Tropical Medicine, Mahidol University, Bangkok, 10400, Thailand. 25. Institute for Molecular Bioscience, University of Queensland, QLD, Australia. 26. Medical Research Council Lifecourse Epidemiology Unit, University of Southampton, Southampton, SO17 1BJ, UK. 27. Division of Human Genetics, The Children’s Hospital of Philadelphia, Philadelphia, PA 19104, USA. 28. Department of Genetics, Perelman School of Medicine, University of Pennsylvania, Philadelphia, 19104, USA. 29. Division of Infection Immunity and Respiratory Medicine, School of Biological Sciences, The University of Manchester, Manchester Academic Health Science Centre, and Manchester University NHS Foundation Trust, Manchester, M13 9NT, UK. 30. Department of Paediatrics, Imperial College London, London, SW7 2AZ, UK. 31. MRC Epidemiology Unit, University of Cambridge School of Clinical Medicine, Cambridge, CB2 0QQ, UK. 32. Department of Nutrition and Dietetics, School of Health Science and Education, Harokopio University, Athens, 17671, Greece. 33. National Institute for Health and Welfare, Helsinki, 00271, Finland. 34. Department of General Practice and Primary Health Care, University of Helsinki and Helsinki University Hospital, Helsinki, 00014, Finland. 35. Folkhälsan Research Center, Helsinki, 00250, Finland. 36. Medical Research Council Integrative Epidemiology Unit at the University of Bristol, Bristol, BS8 2BN, UK. 37. Population Health Sciences, Bristol Medical School, University of Bristol, Bristol, BS8 2BN, UK. 38. University of Queensland Diamantina Institute, Translational Research Institute, Brisbane, QLD, 4072, Australia. 39. Department of Epidemiology Research, Statens Serum Institute, Copenhagen, DK-2300, Denmark. 40. The Generation R Study Group, Erasmus MC, University Medical Center Rotterdam, Rotterdam, 3015 CE, The Netherlands. 41. Department of Epidemiology, Erasmus MC, University Medical Center Rotterdam, Rotterdam, 3015 CE, The Netherlands. 42. Department of Pediatrics, Erasmus MC, University Medical Center Rotterdam, Rotterdam, 3015 CE, The Netherlands. 43. Department of Radiology, Children’s Hospital Los Angeles, Los Angeles, CA 90027, USA. 44. Department of Pediatrics, Perelman School of Medicine, University of Pennsylvania, Philadelphia, PA 19104, USA. 45. Institute for Molecular Medicine Finland FIMM, University of Helsinki, Helsinki, Finland. 46. Department of Pediatrics, University of California San Francisco School of Medicine, San Francisco, CA 94143, USA. 47. NIHR Exeter Clinical Research Facility, University of Exeter Medical School and Royal Devon and Exeter NHS Foundation Trust, Exeter, EX2 5DW, UK. 48. Department of Medicine, Division of Endocrinology, Metabolism, and Molecular Medicine, Feinberg School of Medicine, Northwestern University, Chicago, IL 60611, USA. 49. Department of Child and Adolescent Psychiatry, Psychosomatics and Psychotherapy, University Hospital Essen, University of Duisburg-Essen, Essen, 45141, Germany. 50. Institute of Epidemiology, Helmholtz Zentrum München - German Research Center for Environmental Health, Neuherberg, Germany. 51. Institute and Outpatient Clinic for Occupational, Social and Environmental Medicine, University Hospital of Ludwig Maximilians University, Munich, Germany. 52. KG Jebsen Center for Diabetes Research, Department of Clinical Science, University of Bergen, Bergen, N-5020, Norway. 53. Department of Pediatrics, Haukeland University Hospital, Bergen, 5021, Norway. 54. Department of Genetics and Bioinformatics, Domain of Health Data and Digitalisation, Norwegian Institute of Public Health, Oslo, N-0473, Norway. 55. Department of Paediatrics and Adolescent Medicine, Aarhus University Hospital, Aarhus N, DK-8200, Denmark. 56. Programs in Metabolism and Medical & Population Genetics, Broad Institute of Harvard and MIT, Cambridge, MA 02142, USA. 57. Department of Genetics, Harvard Medical School, Boston, MA 02115, USA. 58. Division of Endocrinology and Center for Basic and Translational Obesity Research, Boston Children’s Hospital, Boston, MA, 02115, USA. 59. Department of Population Medicine, Harvard Pilgrim Health Care Institute, Harvard Medical School, Boston, MA 02215, USA. 60. Diabetes Center, Massachusetts General Hospital, Boston, MA 02114, USA. 61. Department of Medicine, Universite de Sherbrooke, Sherbooke, QC J1K 2R1, Canada. 62. Institute of Nutritional Science, University of Potsdam, Nuthetal, 14558, Germany. 63. The First Affiliated Hospital of Jinan University, Guangzhou, 510630, China. 64. Human Development & Health, Faculty of Medicine, University of Southampton, Southampton, SO17 1BJ, UK. 65. Wellcome Centre for Human Genetics, University of Oxford, Oxford, OX3 7BN, UK. 66. Oxford Centre for Diabetes, Endocrinology and Metabolism, University of Oxford, Oxford, OX3 7LE, UK. 67. RIKEN, Centre for Integrative Medical Sciences, Laboratory for Endocrinology, Metabolism and Kidney diseases, Yokohama, Kanagawa, 230-0045, Japan. 68. Australian Centre for Precision Health, University of South Australia Cancer Research Institute, Adelaide, SA, 5001, Australia. 69. South Australian Health and Medical Research Institute, Adelaide, SA, 5001, Australia. 70. Department of Obstetrics and Gynecology, Sahlgrenska Academy, University of Gothenburg, Diagnosvägen 15, SE-416 85 Gothenburg, Sweden. 71. Biocenter Oulu, University of Oulu, Oulu, 90220, Finland. 72. Unit of Primary Care, Oulu University Hospital, Oulu, 90220, Finland. 73. Center for Life Course Health Research, Faculty of Medicine, University of Oulu, Oulu, FI-90014, Finland. 74. Department of Life Sciences, College of Health and Life Sciences, Brunel University London, Middlesex, UB8 3PH, UK. 75. Department of Medical Genetics, Haukeland University Hospital, Bergen, Norway. 76. Division of Gastroenterology, Hepatology and Nutrition, Cincinnati Children’s Hospital Medical Center, Cincinnati, OH 45229, USA. 77. Observational & Pragmatic Research Institute Pte Ltd, Singapore, Singapore. 78. Pediatric Research Center, Department of Women´s & Child Health, University of Leipzig, Leipzig, 04109, Germany. 79. IFB Adiposity Diseases, University of Leipzig, Leipzig, 04109, Germany. 80. Department of Child Health, School of Medicine, Cardiff Univeristy, Cardiff, CF10 3AT, UK. 81. Danish Pediatric Asthma Center, Copenhagen University Hospital, Gentofte, DK-2100, Denmark. 82. Institute of Social and Preventive Medicine, Lausanne University Hospital (CHUV), Lausanne, 1011, Switzerland. 83. Swiss Institute of Bioinformatics, Lausanne, 1015, Switzerland. 84. Department of Clinical Physiology and Nuclear Medicine, Kuopio University Hospital, Kuopio, 70210, Finland. 85. Kuopio Research Institute of Exercise Medicine, Kuopio, 70100, Finland. 86. Division of Endocrinology, Department of Medicine, Creighton University, Omaha, NE 68178, USA. 87. Bristol NIHR Biomedical Research Centre, Bristol, UK. 88. Department of Clinical Chemistry, Fimlab Laboratories, Tampere University Hospital, Tampere, Finland. 89. Department of Clinical Chemistry, Finnish Cardiovascular Research Center - Tampere, Faculty of Medicine and Life Sciences, University of Tampere, Tampere, 33520, Finland. 90. Li Ka Shing Centre for Health Information and Discovery, The Big Data Institute, University of Oxford, Oxford, OX3 7LF, UK. 91. The Broad Institute of Harvard and MIT, Cambridge, USA. 92. Center for Clinical Research and Prevention, Bispebjerg and Frederiksberg Hospital, The Capital Region, Frederiksberg, 2000, Denmark. 93. Department of Clinical Medicine, Faculty of Health and Medical Sciences, University of Copenhagen, Copenhagen, Denmark. 94. Department of Medicine and Therapeutics, The Chinese University of Hong Kong, Hong Kong, China. 95. Li Ka Shing Institute of Health Sciences, The Chinese University of Hong Kong, Hong Kong, China. 96. Hong Kong Institute of Diabetes and Obesity, The Chinese University of Hong Kong, Hong Kong, China. 97. Estonian Genome Center, University of Tartu, Tartu, 50090, Estonia. 98. Centre for Fertility and Health, Norwegian Institute of Public Health, Oslo, N-0403, Norway. 99. Centre for Genetic Origins of Health and Disease (GOHaD), The University of Western Australia, Crawley, WA, 6000, Australia. 100. Oxford National Institute for Health Research (NIHR) Biomedical Research Centre, Churchill Hospital, Oxford, OX3 7LE, UK. 101. Department of Medicine, Stanford School of Medicine, Stanford, CA 94305, USA. 102. Department of Genetics, University of North Carolina, Chapel Hill, NC 27599, USA. 103. Department of Clinical Epidemiology, Leiden University Medical Center, Leiden, 2333 ZA, The Netherlands. 104. Department of Public Health and Primary Care, Leiden University Medical Center, Leiden, 2333 ZA, The Netherlands. 105. Department of Public Health, Section of Epidemiology, Faculty of Health and Medical Sciences, University of Copenhagen, Copenhagen, Copenhagen, DK-1014, Denmark. 106. Department of Biostatistics, University of Liverpool, Liverpool, L69 3GL, UK. 107. Department of Pediatrics, University of Iowa, Iowa City, IA 52242, USA. 108. Department of Genetics and Bioinformatics, Norwegian Institute of Public Health, Oslo, N-0403, Norway. 109. Research Unit for Gynaecology and Obstetrics, Institute of Clinical Research, University of Southern Denmark, Odense, DK-5000, Denmark. 110. William Harvey Research Institute, Barts and the London School of Medicine and Dentistry, Queen Mary University of London, London, EC1M 6BQ, UK. 111. Medical Research Council (MRC), Social, Genetic and Developmental Psychiatry Centre, Institute of Psychiatry, Psychology & Neuroscience, King’s College London, London, SE5 8AF, UK. 112. Division of Pediatric Endocrinology, Diabetes, and Metabolism, Department of Pediatrics, Columbia University Medical Center, New York, NY 10032, USA. 113. Obesity Prevention Program, Department of Population Medicine, Harvard Medical School and Harvard Pilgrim Health Care Institute, Boston, MA 02215, USA. 114. Department of Paediatrics, University of Cambridge, Cambridge, CB2 0QQ, UK. 115. Wellcome Sanger Institute, Hinxton, Cambridgeshire, CB10 1HH, UK. 116. School of Medicine and Public Health, Faculty of Medicine and Health, The University of Newcastle, Callaghan, NSW, 2308, Australia. 117. Research Centre of Applied and Preventive Cardiovascular Medicine, University of Turku, Turku, 20014, Finland. 118. Max Planck Institute for Psycholinguistics, Nijmegen, 6525 XD, The Netherlands. 119. Section of Genomics of Common Disease, Department of Medicine, Imperial College London, London, SW7 2AZ, UK. 120. Department of Clinical Physiology and Nuclear Medicine, Turku University Hospital, Turku, 20520, Finland. 121. BHF Centre for Cardiovascular Science, University of Edinburgh, Queen’s Medical Research Institute, Edinburgh, EH16 4TJ, UK. 122. Department of Psychology, Mid Sweden University, Östersund, SE-831 25, Sweden. 123. Department of Medicine, Division of Endocrinology, Boston Children’s Hospital, Boston, MA 02115, USA. 124. Program in Medical and Population Genetics, Broad Institute of Harvard and MIT, Cambridge, MA 02142, USA. 125. Center for Basic and Translational Obesity Research, Boston Children’s Hospital, Boston, MA 02115, USA. 126. Saw Swee Hock School of Public Health, National University of Singapore, National University Health System, Singapore, 119077, Singapore. 127. Singapore Eye Research Institute, Singapore, 168751, Singapore. 128. Department of Genomics of Complexe Diseases, Imperial College, London, UK. 129. Department of Epidemiology, Cancer Center, University of Hawaii (Manoa), Honolulu, Hawaii, 96813, USA. 130. Department of Obstetrics and Gynecology, Erasmus MC, University Medical Center Rotterdam, Rotterdam, 3015 CE, The Netherlands. 131. Population Health Research Institute, St George’s University of London, London, SW17 0RE, UK. 132. IMIM (Hospital del Mar Medical Research Institute), Barcelona, 08003, Spain. 133. Department of Statistics and Applied Probability, National University of Singapore, Singapore, 117546, Singapore. 134. Life Sciences Institute, National University of Singapore, Singapore, 117456, Singapore. 135. Division of Metabolic and Nutritional Medicine, Dr. von Hauner Children’s Hospital, University of Munich Medical Center, Munich, 80337, Germany. 136. European Centre for Environment and Human Health, University of Exeter, Truro, TR1 3HD, UK. 137. Department of Internal Medicine, Erasmus MC, University Medical Center Rotterdam, Rotterdam, 3015 CE, The Netherlands. 138. Department of Public Health, Amsterdam Public Health Research Institute, Academic Medical Center (AMC), University of Amsterdam, Amsterdam, 1105 AZ, The Netherlands. 139. Institute of Medical Statistics and Epidemiology, Technical University Munich, Munich, D-80333, Germany. 140. Institute of Medical Informatics, Biometry and Epidemiology, Ludwig Maximilians University, Munich, 81377, Germany. 141. Usher Institute for Population Health Sciences and Informatics, University of Edinburgh, Edinburgh, EH8 9AG, UK. 142. MRC Human Genetics Unit, Institute of Genetics and Molecular Medicine, University of Edinburgh, Edinburgh, EH4 2XU, UK. 143. Genetics of Complex Traits, University of Exeter Medical School, Royal Devon & Exeter Hospital, Exeter, EX2 5DW, UK. 144. Department of Clinical Epidemiology and Biostatistics, Amsterdam Public Health Research Institute, Academic Medical Center, University of Amsterdam, Amsterdam, The Netherlands, 1105 AZ, The Netherlands. 145. Division of Gastroenterology, Hepatology and Nutrition, The Children’s Hospital of Philadelphia, Philadelphia, PA 19104, USA. 1. COPSAC, Copenhagen Prospective Studies on Asthma in Childhood, Herlev and Gentofte Hospital, University of Copenhagen, Copenhagen, 2900 Hellerup, Denmark. 2. Novo Nordisk Foundation Center for Basic Metabolic Research, Section of Metabolic Genetics, Faculty of Health and Medical Sciences, University of Copenhagen, Copenhagen, DK-2200, Denmark. 3. Steno Diabetes Center Copenhagen, Gentofte, 2820, Denmark. 4. Center for Life Course Health Research, Faculty of Medicine, University of Oulu, Oulu, FI-90014, Finland. 5. Amsterdam Public Health, Amsterdam, The Netherlands. 6. Department of Biological Psychology, Vrije Universiteit Amsterdam, Amsterdam, 1081 BT, The Netherlands. 7. Netherlands Twin Register, Department of Biological Psychology, VU University, Amsterdam, 1081 HV, The Netherlands. 8. University of the Basque Country (UPV/EHU), Spain. 9. Biocruces Health Research Institute, Spain. 10. CIBER Diebetes y Enfermedades Metabólicas (CIBERDEM), Spain. 11. Amsterdam Reproduction and Development, Amsterdam, The Netherlands. 12. Center for Applied Genomics, The Children’s Hospital of Philadelphia, Philadelphia, PA 19104, USA. 13. Quantinuum Research LLC, San Diego, CA, 92101, USA. 14. ISGlobal, Institute for Global Health, Barcelona, 08003, Spain. 15. Universitat Pompeu Fabra (UPF), Barcelona, 08003, Spain. 16. CIBER de Epidemiología y Salud Pública (CIBERESP), Madrid, 28029, Spain. 17. Department of Preventive Medicine, Keck School of Medicine, University of Southern California, Los Angeles, California, USA. 18. Division of Infection Immunity and Respiratory Medicine, School of Biological Sciences, The University of Manchester, Manchester Academic Health Science Centre, and Manchester University NHS Foundation Trust, Manchester, M13 9NT, UK. 19. Department of Paediatrics, Imperial College London, London, SW7 2AZ, UK. 20. Medical Research Council Integrative Epidemiology Unit at the University of Bristol, Bristol, BS8 2BN, UK. 21. Population Health Sciences, Bristol Medical School, University of Bristol, Bristol, BS8 2BN, UK. 22. Avera Institute for Human Genetics, Sioux Falls, South Dakota, USA. 23. The Generation R Study Group, Erasmus MC, University Medical Center Rotterdam, Rotterdam, 3015 CE, The Netherlands. 24. Department of Pediatrics, Division of Respiratory Medicine, Erasmus MC, University Medical Center Rotterdam, Rotterdam, The Netherlands. 25. Department of Pediatrics, Division of Neonatology, Erasmus MC, University Medical Center Rotterdam, Rotterdam, The Netherlands. 26. School of Human Sciences, The University of Western Australia, WA, Australia. 27. West Australian Sleep Disorders Research Institute, Department of Pulmonary Physiology & Sleep Medicine, Sir Charles Gairdner Hospital, WA, Australia. 28. Copenhagen Prospective Studies on Asthma in Childhood, Herlev and Gentofte Hospital, University of Copenhagen, Denmark. 29. Department of Bio and Health Informatics, Technical University of Denmark, Denmark. 30. Sidra Medicine Research Center, Sidra Medicine, Doha, Qatar. 31. University of Queensland Diamantina Institute, Translational Research Institute, Brisbane, QLD, 4072, Australia. 32. Department of Epidemiology, Erasmus MC, University Medical Center Rotterdam, Rotterdam, 3015 CE, The Netherlands. 33. Department of Pediatrics, Erasmus MC, University Medical Center Rotterdam, Rotterdam, 3015 CE, The Netherlands. 34. Division of Human Genetics, The Children’s Hospital of Philadelphia, Philadelphia, PA 19104, USA. 35. Department of Pediatrics, Perelman School of Medicine, University of Pennsylvania, Philadelphia, PA 19104, USA. 36. Department of Genetics, Perelman School of Medicine, University of Pennsylvania, Philadelphia, 19104, USA. 37. Department of Psychiatry, University of Groningen, University Medical Center Groningen, Groningen, The Netherlands. 38. Institute of Epidemiology, Helmholtz Zentrum München - German Research Center for Environmental Health, Neuherberg, Germany. 39. Institute and Outpatient Clinic for Occupational, Social and Environmental Medicine, University Hospital of Ludwig Maximilians University, Munich, Germany. 40. Institute for Molecular Bioscience, University of Queensland, QLD, Australia. 41. Telethon Kids Institute (TKI), The University of Western Australia, WA, Australia. 42. Australian Centre for Precision Health, University of South Australia Cancer Research Institute, Adelaide, SA, 5001, Australia. 43. South Australian Health and Medical Research Institute, Adelaide, SA, 5001, Australia. 44. Population, Policy and Practice, UCL Great Ormond Street Institute of Child Health, University College London, London, WC1N 1EH, UK. 45. Department of Statistics and Computational Research, Universitat de València, Spain. 46. Epidemiology and Environmental Health Joint Research Unit, FISABIO-Universitat Jaume I-Universitat de València, Spain. 47. Department of Obstetrics and Gynecology, Sahlgrenska Academy, University of Gothenburg, Diagnosvägen 15, SE-416 85 Gothenburg, Sweden. 48. Department of Genetics and Bioinformatics, Domain of Health Data and Digitalisation, Norwegian Institute of Public Health, Oslo, N-0473, Norway. 49. Department of Epidemiology and Biostatistics, MRC-PHE Centre for Environment & Health, School of Public Health, Imperial College London, London, W2 1PG, UK. 50. Biocenter Oulu, University of Oulu, Oulu, 90220, Finland. 51. Unit of Primary Care, Oulu University Hospital, Oulu, 90220, Finland. 52. Department of Life Sciences, College of Health and Life Sciences, Brunel University London, Middlesex, UB8 3PH, UK. 53. Department of Genetics and Bioinformatics, Norwegian Institute of Public Health, Oslo, N-0403, Norway. 54. Centre for Fertility and Health, Norwegian Institute of Public Health, Oslo, N-0403, Norway. 55. Department of Global Public Health and Primary Care, University of Bergen, Norway. 56. Department of Clinical Physiology, Tampere University Hospital, Tampere, Finland. 57. Department of Clinical Physiology, Finnish Cardiovascular Research Center - Tampere, Faculty of Medicine and Life Sciences, University of Tampere, Tampere, Finland. 58. Institute for Molecular Medicine Finland FIMM, University of Helsinki, Helsinki, Finland. 59. Department of Public Health, University of Helsinki, Helsinki, Finland. 60. Department of Epidemiology and Biostatistics, School of Public Health, Imperial College London, London, UK. 61. University of Groningen, University Medical Center Groningen, Department of Pediatric Pulmonology and Pediatric Allergology, Beatrix Children’s Hospital, GRIAC Research Institute Groningen, Groningen, The Netherlands. 62. Institute of Environmental Medicine, Karolinska Institutet, Sweden. 63. Department of Public Health Epidemiology, Unit of Chronic Disease Epidemiology, Swiss Tropical and Public Health Institute, Basel, University of Basel, Switzerland. 64. Helsinki Collegium for Advanced Studies, University of Helsinki, Helsinki, Finland. 65. Department of Psychology and Logopedics, Faculty of Medicine, University of Helsinki, Helsinki, Finland. 66. School of Medicine Sciences, Örebro University, Sweden. 67. Department of Medical Epidemiology and Biostatistics, Karolinska Institutet, Sweden. 68. Bristol NIHR Biomedical Research Centre, Bristol, UK. 69. Department of Clinical Chemistry, Fimlab Laboratories, Tampere University Hospital, Tampere, Finland. 70. Department of Clinical Chemistry, Finnish Cardiovascular Research Center - Tampere, Faculty of Medicine and Life Sciences, University of Tampere, Tampere, 33520, Finland. 71. Centre for Ethics, Law and Mental Health, University of Gothenburg, Sweden. 72. Gillberg Neuropsychiatry Centre, University of Gothenburg, Sweden. 73. Institute for Social Science Research, University of Queensland, QLD, Australia. 74. QIMR Berghofer Medical Research Institute, QLD, Australia. 75. Sachs’ Children’s Hospital, Sweden. 76. Child Health Research Centre, University of Queensland, Brisbane, QLD, Australia. 77. Child and Youth Mental Health Service, Children’s Health Queensland Hospital and Health Service, Brisbane, QLD, Australia. 78. School of Public Health, The University of Queensland, QLD, Australia. 79. Department of Epidemiology, University of Groningen, University Medical Center Groningen, Groningen, The Netherlands. 80. Research Centre of Applied and Preventive Cardiovascular Medicine, University of Turku, Turku, 20014, Finland. 81. Paavo Nurmi Centre, Sports and Exercise Medicine Unit, Department of Physical Activity and Health, University of Turku, Turku, Finland. 82. School of Medicine and Public Health, Faculty of Medicine and Health, The University of Newcastle, Callaghan, NSW, 2308, Australia. 83. Centre for Occupational and Environmental Medicine, Stockholm County Council, Sweden. 84. MRC Social, Genetic and Developmental Psychiatry Centre, King’s College London, London, UK. 85. Max Planck Institute for Psycholinguistics, Nijmegen, 6525 XD, The Netherlands. 86. Department of Psychology, University of Jyväskylä, Jyväskylä, Finland. 87. Department of Clinical Physiology and Nuclear Medicine, Turku University Hospital, Turku, 20520, Finland. 88. Department of Internal Medicine, Erasmus MC, University Medical Center Rotterdam, Rotterdam, 3015 CE, The Netherlands. 89. Department of Psychological and Brain Sciences, Indiana University, Bloomington, Indiana, USA. 90. Subdirección de Salud Pública y Adicciones de Gipuzkoa, San Sebastián, Spain. 91. Instituto de Investigación Sanitaria Biodonostia, San Sebastián, Spain. 92. Metro North Mental Health Service, QLD, Australia. 93. Queensland Centre for Mental Health Research, QLD, Australia. 94. Department of Genomics of Complexe Diseases, Imperial College, London, UK. 95. Norwegian Institute of Public Health, Norway. 96. Population Health Research Institute, St George’s University of London, London, SW17 0RE, UK. 97. School of Physiotherapy and Exercise Science, Faculty of Health Sciences, Curtin University, Perth, WA, Australia. 98. Helsinki University Central Hospital, University of Helsinki, Helsinki, Finland. 99. Clinicum, University of Helsinki, Helsinki, Finland. 100. IMIM (Hospital del Mar Medical Research Institute), Barcelona, 08003, Spain. 101. Division of Metabolic and Nutritional Medicine, Dr. von Hauner Children’s Hospital, University of Munich Medical Center, Munich, 80337, Germany. 102. Child and Adolescent Psychiatry, Erasmus Medical Center, Rotterdam, The Netherlands. 103. Social and Behavioral Sciences, Harvard TH Chan School of Public Health, Harvard University, Boston, USA. 104. ib-salut, Area de Salut de Menorca, Spain. 105. Fundació Institut d’Investigació Sanitària Illes Balears – IdISBa, Spain. 106. Department of Medicine, University of Turku, Turku, Finland. 107. Division of Medicine, Turku University Hospital, Turku, Finland. 108. Center for Genomic Regulation (CRG), Barcelona Institute of Science and Technology, Spain. 109. Barcelonabeta Brain Research Center (BBRC), Pasqual Maragall Foundation, Barcelona, Spain. 110. Groningen Research Institute for Asthma and COPD (GRIAC), University of Groningen, University Medical Center Groningen, Groningen, 9700 RB, The Netherlands. 111. Department of Public Health, Amsterdam Public Health Research Institute, Academic Medical Center (AMC), University of Amsterdam, Amsterdam, 1105 AZ, The Netherlands. 112. Queensland Brain Institute, University of Queensland, QLD, Australia. 113. Department of Clinical Epidemiology and Biostatistics, Amsterdam Public Health Research Institute, Academic Medical Center, University of Amsterdam, Amsterdam, The Netherlands, 1105 AZ, The Netherlands.